With the Suffolk County Board of Elections certifying his Jan. 15 special election victory Tuesday, Al Krupski will be sworn in as the county legislator for the North Fork and Shelter Island at the County Center in Riverhead on Wednesday. Mr. Krupski said he expects a quick, no-frills event when he takes his oath in the County Clerk’s office at 11 a.m. The Southold Democrat will step into the office previously held by Ed Romaine, a Center Moriches Republican. With Mr. Romaine’s election in November to Brookhaven Town supervisor, Mr. Krupski will serve the 11-plus months left in Mr. Romaine’s term. He already took possession of his predecessor’s legislative office in the Cooperative Extension building in Riverhead. Mr. Krupski, who is leaving his Southold Town Board seat, handily defeated Republican Riverhead Supervisor Sean Walter in the Jan. 15 special election. His two-to-one victory margin was the highest of any special election held in Suffolk over the past decade. 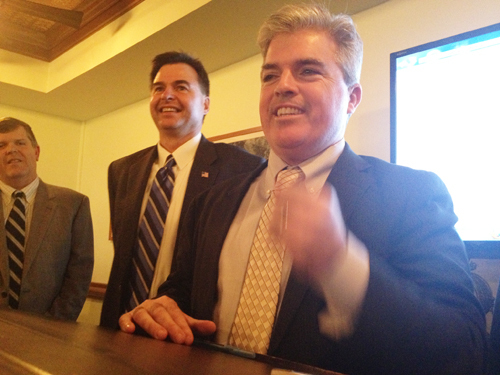 GIANNA VOLPE PHOTO | County Executive Steve Bellone (right) said that with Tuesday’s landslide victory, Al Krupski (middle) is now the most popular elected official in county government. Councilman Al Krupski has handily defeated Riverhead Supervisor Sean Walter for the 1st District seat in the Suffolk County Legislature. Polls for Tuesday’s special election closed at 9 p.m. and — before the Board of Elections update page crashed — Mr. Krupski had 6,445 votes to Mr. Walter’s 3,076, with 62 of 65 districts reporting. That’s good for 68 percent to 32 percent. County Executive Steve Bellone (D-Babylon) showed to Democratic election night headquarters at Dark Horse restaurant in Riverhead not long after Mr. Walter conceded with a handshake and some words congratulating his opponent. Mr. Krupski’s win now gives the Democrats a veto-proof majority in the Legislature. “Al, you are now the most popular elected official in county government,” Mr. Bellone said of the final vote tally. Click below in our live blog for reports from the two party headquarters, as well as readers comments, photos and reactions. There’s also a video of Mr. Walter’s concession speech to his supporters. 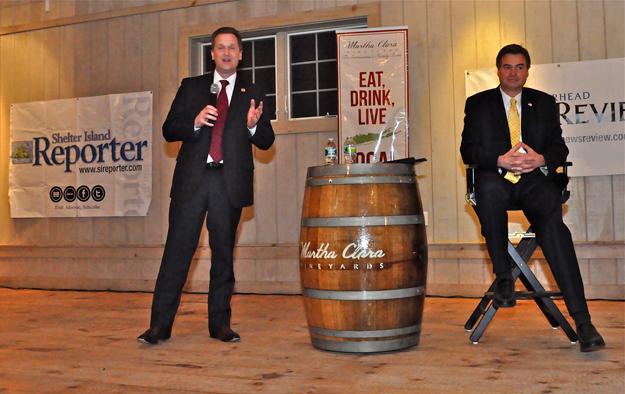 TIM KELLY PHOTO | Republican Riverhead Town Supervisor Sean Walter (left) in debate with Democrat Al Krupski at Martha Clara Vineyards Monday night, as both men seek the Suffolk County Legislature’s 1st District seat. Mr. Walter and Mr. Krupski squared off in a debate Monday. Click here for full coverage. Al Krupski is the Democratic and Working Families candidate to replace Ed Romaine as 1st District Suffolk County Legislator in tonight’s special election. Mr. Krupski, whose family owns and operates a Peconic pumpkin farm, served as a Town Trustee for 20 years and has now been a Town Board member for eight years. He said the issues he’d face at the county level are similar to those he’s already dealing with as a Southold Town Councilman and Deputy Supervisor. If Mr. Krupski were to be elected, county Democrats would have a veto-proof majority in the Legislature. Mr. Krupski pointed out that, as the only Democrat on the Southold Town Board, he had a long history of bipartisan cooperation. He also noted during his campaign that he’s be the first Southold Town resident and the first farmer to represent the 1st District in the Legislature. Born and raised in Peconic, he lives with his wife Mary and three children in Cutchogue. He holds a degree in plant science from the University of Delaware. He has served on the Peconic Land Trust Board of Directors and is a member of the North Fork Chamber of Commerce.